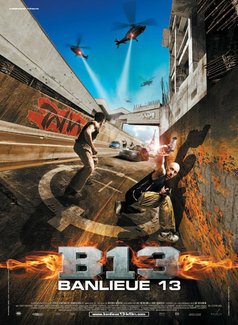 Luc Besson's created another high-energy action thrill ride with Banlieue 13. District B13 is a run down slum that's been walled off by the French government. The people behind lack simple public services such as garbage collection or public schooling, and the district is run by criminal organizations and smaller gangs. Leïto's a sort of vigilante trying to take down the local power Taha, but runs into trouble with the authorities allowing Taha to enslave Leïto's sister, Lola. The remainder of the film follows Leïto's attempts to free his sister while working with an undercover cop named Damien to prevent the detonation of a nuclear warhead. With only that simple plot and its over-the-top likable characters, this movie wouldn't be worth mentioning much. But Luc Besson really knows how to create a great ride and District B13 certainly doesn't disappoint. Leïto is actually played by David Belle who is famous for the parkour movement. This film is an amazing showcase of that physical art form, with extended sequences of parkour throughout. The action is swift, tight, and filmed very well so the audience can clearly follow everything. Many times a director will use quick cuts and jerky motion to create a false sense of excitement and activity, but that's not the case here. All in all an excellent action film that's a lot of fun to watch, and fun to watch a second time.